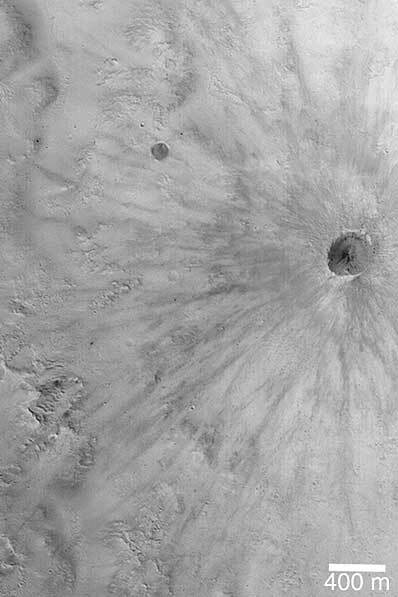 This Mars Global Surveyor (MGS) Mars Orbiter Camera (MOC) image shows a fresh, young meteor impact crater on the martian surface. It is less than 400 meters (less than 400 yards) across. While there is no way to know the exact age of this or any other martian surface feature, the rays are very well preserved. On a planet where wind can modify surface features at the present time, a crater with rayed ejecta patterns must be very young indeed. Despite its apparent youth, the crater could still be many hundreds of thousands, if not several million, of years old. This impact scar is located within the much larger Crommelin Crater, near 5.6 deg N, 10.0 deg W. Sunlight illuminates the scene from the left. Explore the Red Planet from the comfort of your home with this interactive DVD. Includes 3D glasses for viewing three-dimensional images of Mars.